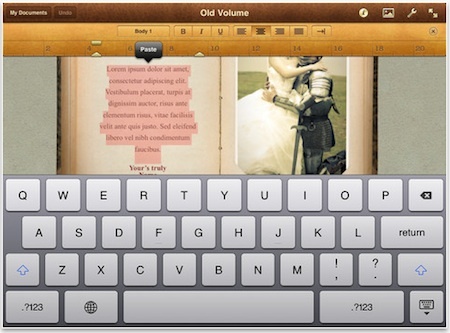 Pages on the iPad opens up a whole world of creating documents while being completely mobile. This can mean a simple letter or resume to multipage newsletters and flyers. Gone are the days of having to be sitting at the desktop to get a pamphlet out to a client. Gone are the days of staring at the blank monitor, waiting for an idea to hit so you can start filling in the white canvas. In the case of starting a document on the iPad, the screen is smaller but the blankness can be the same. Pages offers a whole world of layout options. You can set text areas, add images, arrange the depth, adjust fonts, flow content across multiple pages… all with your fingers on the iPad screen. On the desktop, sometime it helps to get started by looking around the Internet with the browser, or flipping through a magazine. Both are possible on the iPad, but we recommend a more ‘jump in and get started’ path. One of the many options is Stationary Set by Jumsoft. 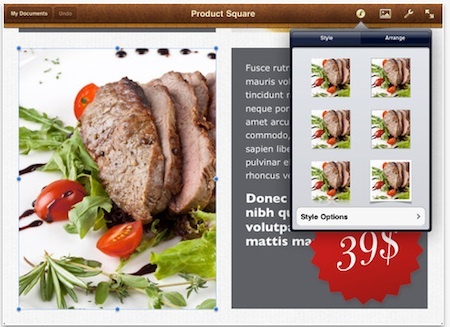 The ‘app’ contains over 100 templates (over 230 pages), many of which have multiple pages. Each page in a group with a different layout, perfect for newsletters. You simply install the app, search through it for something close to your idea, ‘open in’ Pages, then start to play from there. The majority of the boxes, both text and images, can be moved around to match the design you where heading towards. Even most of the highlight coloring can be changed to best match your needs. 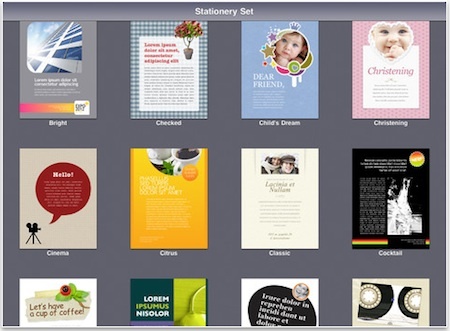 In the case of Stationary Set, these are universal templates to you can start your work on your iPhone and iPad then share with the other. It’s all about just getting started. It not only get the project moving but we sleep better knowing we don’t have to look at a blank canvas for long.